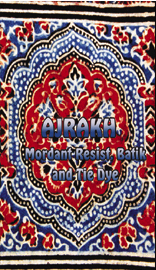 The complex process of creating Ajrakh cloth was introduced by the Moghuls and the detailed patterns are reputed to be Sufi designs. 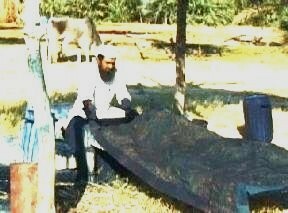 Produced by the men of Muslim communities the cloth is used by them for shawls, lunghis and turbans. The film shows in detail the making of the hand carved printing blocks and the block printed mordant dyed and resist process in Damadka. The film also includes a fascinating section on block printing with wax and the tying and dyeing of beautiful saris and dupattas in Kutch. Filmed in the Rann of Kutch. Contents include: hand carving printing blocks, application of mordant and resist, dyeing indigo and alazarin/madder, printing with wax, tying cloth.